With world-class rock climbing at Smith Rock and the spectacular peaks of the Cascade Range, Central Oregon offers some of the best climbing and mountaineering opportunities in the country. Central Oregon's indoor rock climbing facility! From the nervous beginner to those planning an adventurous family outing, we have something for everyone. Walk in's welcome! Personalized rock climbing instruction and guiding services with an AMGA-Accredited guide service at Smith Rock State Park. All abilities and ages. We get climbers of all abilities out climbing the rocks. Come enjoy a great Central Oregon adventure of rock climbing at Smith Rock State Park with us. The original Smith Rock climbing guides since 1983, we offer instructional rock climbing courses and guided climbs by a team of AMGA trained guides. 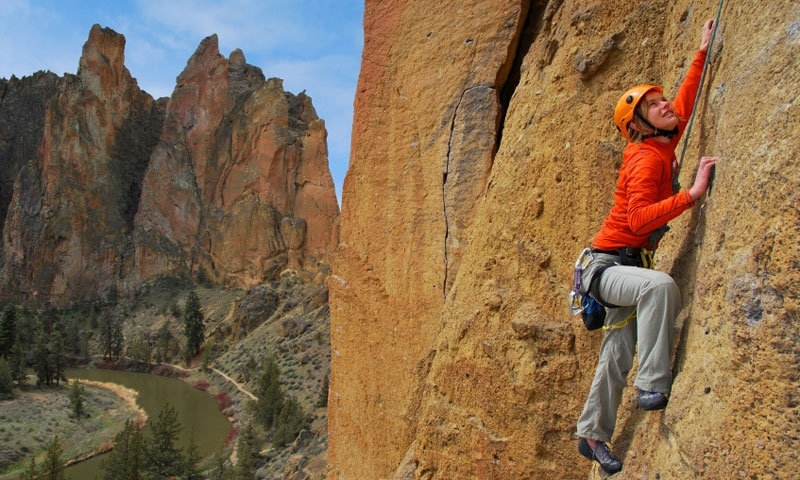 Enjoy world class rock climbing at Smith Rock State Park just east of Redmond. Challenge your mountaineering expertise on the dangerous northeast face of Three Fingered Jack. Enjoy stunning views of Mt. Jefferson, the Three Sisters, and Three Fingered Jack from the summit of Mt. Washington. Ski down 4,000 vertical feet on Diamond Peak during the winter. Central Oregon offers avid rock climbers and mountaineers an excellent range of places to challenge their skills. The multitude of volcanic peaks in the Cascade Range attracts many mountain climbers each year, with summits that boast breathtaking views. Avid rock climbers from all over the world come to scale the challenging rock faces at Smith Park, where they’ll find over 1800 different climbing routes from which to choose. Smith Rock State Park – Rock climbing at its best can be found at Smith Rock State Park, located just east of Redmond. With towering rock walls that reach up to 500 feet, it is one of Central Oregon’s most popular attractions. There are over 1800 climbing routes within the park. Mt. Jefferson – Although it’s a bit difficult to access the second highest mountain in Oregon, the 10,497-foot summit provides a challenging experience that attracts many climbers. Mt. Washington – One of the more popular Cascade volcanoes for climbers, the 7,794-foot summit offers stunning views of Mt. Jefferson, the Three Sisters, and Three Fingered Jack. The easiest route, ranging from Class 5.0 to 5.3, is the North Ridge. Three Fingered Jack – This jagged 7,841-foot Cascade peak attracts many experienced mountaineers. A severely eroded shield volcano, its northeast face is regarded as one of the most difficult and dangerous climbs in Oregon. Three Sisters – The South Ridge of the South Sister is a steep but non-technical climb, while the North Sister is considered the most difficult climb of the three 10,000-foot-plus peaks. Broken Top – This rugged peak is a favorite with avid climbers. The Northwest Ridge is the summit route most climbers take. As you plan your next rock or mountain climbing excursion in or near Bend, take some time to explore the various climbing guides and outfitters listed on this web page.